Fear the Walking Dead is threading storylines together for the season finale. MM 54 is loaded with reveals. We finally learn the identity of the psychotic Filthy Woman (Tonya Pinkins), and what led her to madness. Morgan (Lennie James) and the semi truck group face a harrowing predicament. Alicia (Alycia Debnam-Carey) tries to fulfill Charlie's (Alexa Nisenson) dream. A new cast member gets bitten. Hint, the brewery fantasy is not going to be realized. MM 54 refers to mile marker 54. The episode opens in the past with a tragic car accident. A man (John Eric Bentley) in the passenger seat is speared by the highway guardrail. The Filthy Woman is his wife. She frantically tries to flag cars down, but no one stops. She promises her husband that someone will help. A walker comes out of the woods. She kills it with a rake left in the road. She continues to weep by the car overnight. The next morning, her husband has turned. She kills him with a piece of glass. Then digs a grave with her bare hands, becoming covered in dirt. What follows is a montage of her losing her mind at the grave. Some time later, a semi pulls over by the accident. A woman comes out and puts down a supply box. The Filthy Woman approaches her. The good samaritan asks if she needs help, that her group puts the boxes every ten miles. The Filthy Woman introduces herself as Martha. She was an English teacher. Martha asks her to correct the grammar on the box, before spearing the woman through the throat with a rake. Martha goes on a mission to wipe out the truckers. She kills them one by one. Watching them turn into walkers, then using them to attack their fellow samaritans. After a kill, she radios to set up the next victim. But it's Morgan that responds. Their connection comes full circle. Morgan was speaking to Martha when he answered the radio at the truck stop. In the present, Martha has riddled the MRAV with bullets. June (Jenna Elfman) has a leg wound. Luciana (Danay Garcia) has been knocked out. Al (Maggie Grace) may have a ruptured eardrum. Morgan leads them out of the back. The fuel drums inside are leaking. Sarah (Mo Collins) has a flesh wound. Wendell (Daryll Mitchell) lowers himself out of the cab, but his wheelchair has been destroyed. He crawls towards the rear of the truck. The MRAV pulls up behind them. Al foolishly races to the back door and opens it. A flood of walkers come out, pinning June. Martha stands in the back with a gun pointing towards Morgan. He tries to reason with her. Wendell shoots Martha in the shoulder with a shotgun. Al saves June from a walker. Martha cackles toward the gathering walkers, then speeds away. The semi explodes. Later that day, Alicia and Charlie find the burnt out semi. They see the walker bodies with writing on the faces, but no sign of Morgan or the group. Charlie is afraid, they have to find them. Alicia has no idea what direction they took. She gets back in the car, then decides to drive east. Morgan's group is walking down the highway. A herd of walkers is forming behind them. Jim (Aaron Stanford) is pulling Wendell, but has finally had enough. He blames Morgan for getting them all in this predicament. Morgan sees a sign for a hospital. He wants to go there, where June can tend to their injuries. Jim decides to go out on his own. But then changes his mind and joins the group. In the hospital, Morgan has barricaded the entrance. Walkers are piling up outside. June has found supplies and helped the others. The remaining group attempts to clear out the hallways. Sarah finds a new set of walkie-talkies. Al asks Wendell what happened to his legs. He saved a friend from getting hit by a car as boy, but paid the price. He thought he could help people. Wendell tried to join the marines when he turned eighteen, but was ridiculed. Sarah was a marine, but quit after Wendell's treatment. Wendell tells Al that bad things happen when you try to help people. He understands why Martha is so angry. Jim attempts to apologize to Morgan at the entrance. He's interrupted when the barricade fails. Morgan radios for everyone to go upstairs. They group separates and tries to barricade all of the entrances. Jim and Morgan are attacked by walkers. Jim is thrown through a glass door, but stabs the walker in the head with scissors. Morgan decides to use the stairwell to keep moving them higher. On the top floor, they barricade all the entrances. Jim again berates Morgan for getting them stuck. Al and Sarah go to turn on the generators. With the power on, they can use the elevator to reach the roof. Luciana screams for them to hurry, the walkers are breaking through. Alicia and Charlie have run out of gas. They abandon the car to search for fuel. Alicia admits that she's no longer looking for Morgan and the others. She wants to take Charlie to Galveston, so the girl can finally see the beach. Charlie is upset that they've given up on their friends. At the generator, the walkers are closing in. Al tells Sarah to be with her brother. Sarah joins the group at the elevator. The barricade fails and the walkers are pouring in from all sides. Suddenly the lights turn on, Al has activated the generator. The race inside and take the elevator to the roof. On the roof, they quickly discover that the fire escape is broken. They are trapped. Sarah radios for Al, but gets no response. June says that Al is a survivor. She goes to tend a cut on Jim's back, but then realizes that Jim has been bitten. Morgan is shaken by his failure to protect Jim. June asks him what they should do next. Morgan doesn't have a clue. June has faith he will get them off the hospital roof. Alicia and Charlie are walking across a field. Alicia admits that she has no idea what to do. She hoped getting Charlie to the beach would be the right way. Charlie hears the sound of rushing water. They follow the noise and reach the flooded banks, where Charlie finds John's black cowboy hat. Alicia looks across the water and smiles. "MM 54" is setting up a reunion on all fronts. The hospital group will be able to communicate with Alicia via the radio. I'd guess Alicia, John, and Victor will attempt a rescue, but then be thwarted by Martha somehow. It's a pretty safe bet that Al escaped. Jim's character was annoying as hell. We'll see if he dies valiantly trying to save the others. 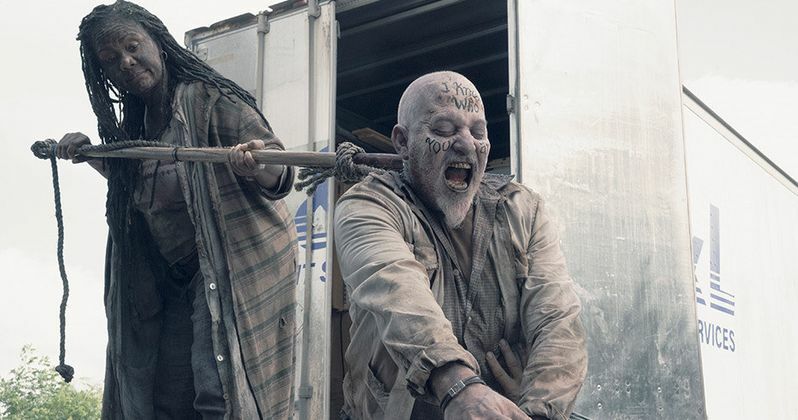 Fear the Walking Dead has two episodes remaining in season 4 on https://www.amc.com/shows/fear-the-walking-dead/season-4/episode-14-mm-54|AMC.